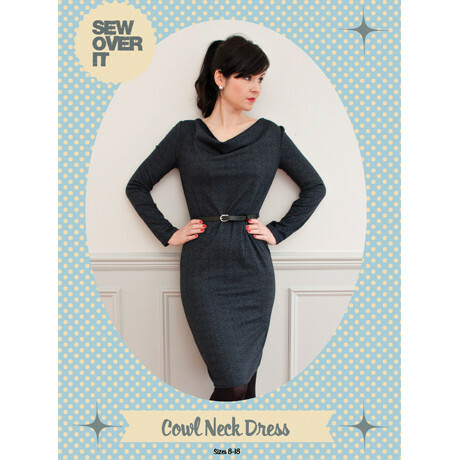 The Cowl neck sewing pattern from Sew Over It, is perfect if you’re new to sewing with stretch fabrics. It’s only got three pattern pieces so great for a beginner maker. 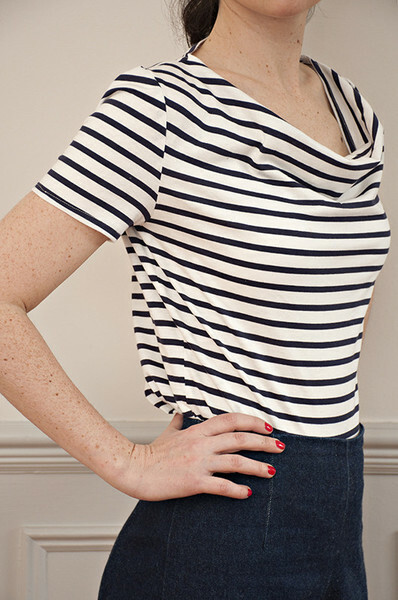 What we think: It’s such a simple construction we reckon that you could have this made up in under an hour if you’re speedy and if you’re new to sewing with stretch you’ll be wearing it by the end of the day! 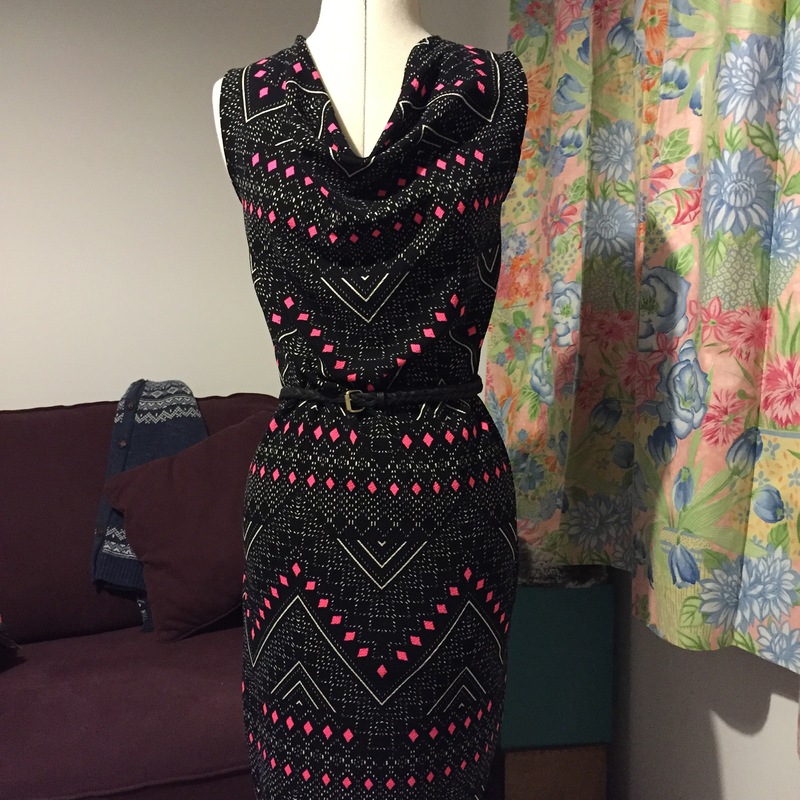 I had a party with a fifties theme, and decided that the Sew Over It Cowl neck dress was the pattern for me. Leaving things to the last minute (as usual) I really wasn’t sure I was going to achieve this, but it’s a lovely straightforward make and can easily be achieved in an afternoon before heading off to the Ball. I loved the fabric (silver-grey velour – I know, it sounds like an awful early nineties tracksuit, but it felt lovely) from Sweet Seams Sewing Academy and I’m sure I’ll make more of these dresses in the future. The only change I’d definitely make would be some staytape along the back neckline – far too easy for it to stretch out there, and I should have foreseen it! This is my second time making this pattern, but the first time I am trying the first version. I’m pretty pleased with the result although I had to make a small alteration to the shoulders, as they ended up too wide on me. I also took in the dress in as I prefer a more fitted silhouette. It’s a really quick sew, but could have nicer details. It did not address adding stabilizers to the shoulders or back neck. I added a bit of twill tape along the entire back, it was sewn with the shoulder seams, and folded the back neck along it. The bodice has a nice fit, and I like the cowl, but I found the sleeves to wide and long for a jersey garment. The hems would look nicer with a wider fold over, on the sleeves I roled 1cm inside and again 3cm, but I had not thought about it for the body hem. I’ve made a few of the cowl neck tops and only one dress. The tops I’ve made from a ponte roma (pic above) and the others from much drapier knits – I prefer the drapier ones as the cowl looks nicer with these. Since the first two I’ve also altered the cowl part of the pattern to add a bit more material – I find with the ones without this tend to flip out a little and show the edge of the fabric. I made very few adjustments to the pattern other than this. I’d say advanced beginner as working with knits and I don’t remember seeing instructions about stabilising the shoulders etc (as others do) but since making one or two of these, I’ve not referred to the instructions since! The pattern does not include (what I would consider) basic marks like the “Lengthen or Shorten” lines. As I know I always need to increase the length of the body (or never feel comfortable in the make), I was a little saddened not to see this. The pattern is billed as Advanced Beginner and having made lots of clothes for myself 15 years ago, but little since, I thought I fitted the bill. However, I had no idea where to start to add in my own line to cut the pattern pieces. I emailed the firm asking where these lines should be, and was impressed to get a response quickly, although the response was basically saying that it was an individual thing and they couldn’t help. I therefore had to look at other patterns for beginners (ie Tilly) and try to work out where the line should be from that other information. I think this pattern was originally made for classes, so presumably any questions like this would have been covered in that forum. 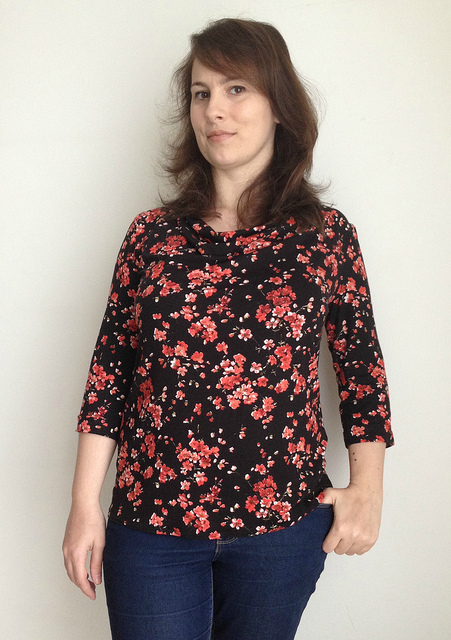 The finished garment is fine, and now that I have my altered pattern pieces, I might make it again. But I’m unlikely to purchase another Sew Over It pattern. Pleased with the end product, but not the process. I’ve made this dress 3 times now. The first was a wearable muslin in a cheap and nasty jersey. Nonetheless it turned out quite nicely. 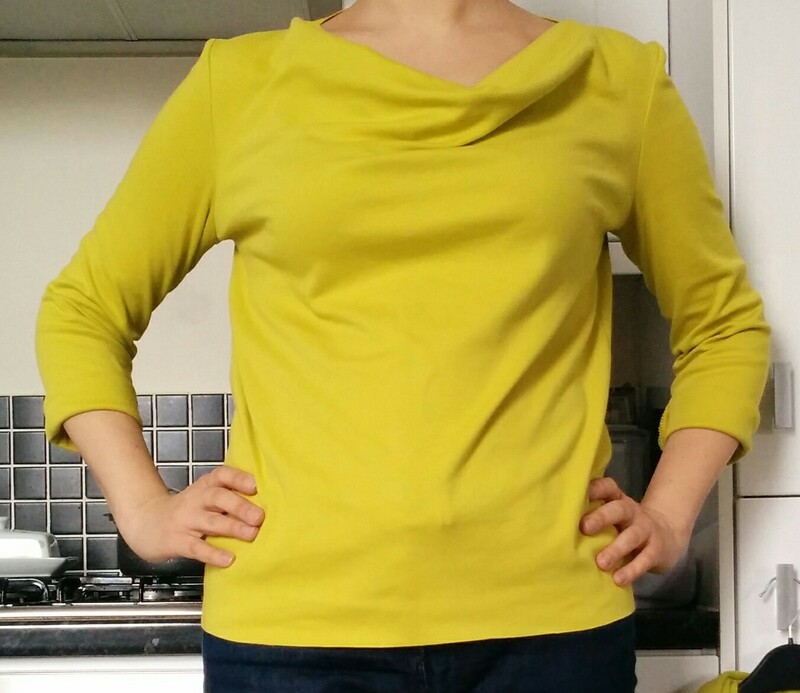 Took several inches off the length and also sleeve length ‘cos I’m a shortie, but this was pretty simple. 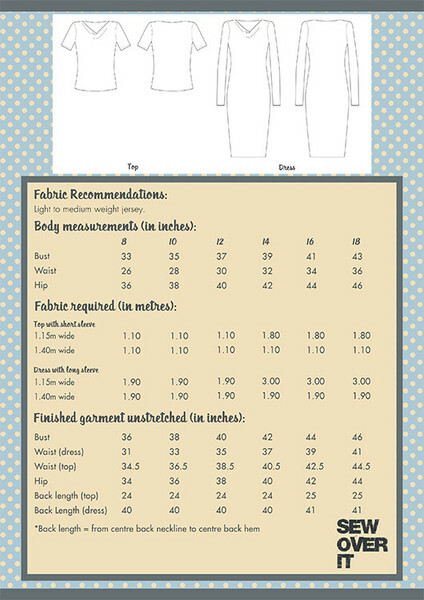 Fit was easy as the knit fabric does most of the fitting for me. Subsequent 2 versions were in quality ponte Roma fabric – lovely. Have had positive comments from friends and relatives who didn’t know I’d made the dresses myself. This is a classy dress, which is easy to make and very comfortable to wear. Only real gripe is that it’s only available in PDF format.